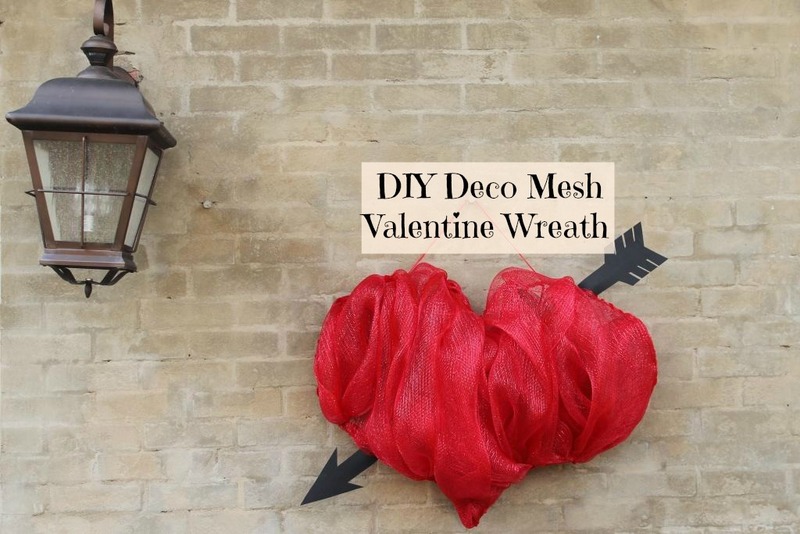 deco mesh wreaths which was also a heart shaped one. back and forth vertically across the middle of the form. not that common even on the internet. 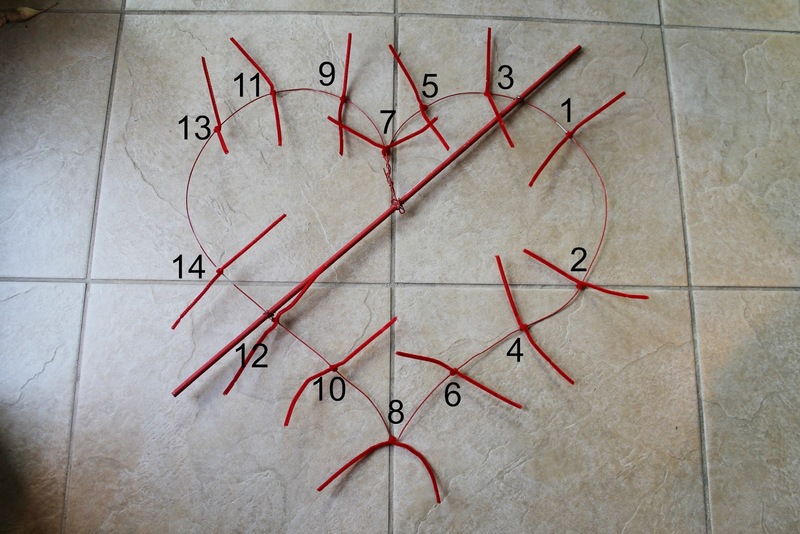 wire to form a heart shape. I used a purchased 24"
Christmas) as a size guideline so I wouldn't make it too large. I knew that this size only required one roll of deco mesh. use floral wire to attach a dowel rod to the heart. This will become an arrow later on. Paint the wires and the dowel with red craft paint. and the arrow makes these structures less noticeable. phase but you can go back and touch it up if needed. to the wire frame. (We used to call them "pipe cleaners"). will attach the mesh to the frame. ...then twist the two parts of the stem together. stem for extra holding especially if you don't have time for glue. 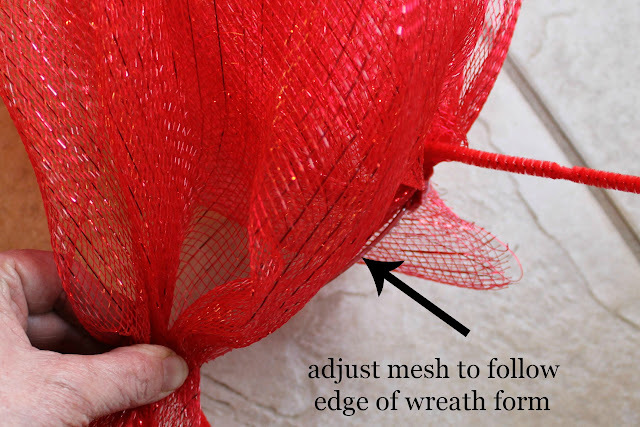 arms are open to the top side of the wreath to accept the mesh. wire frame with craft glue. It keeps them from moving around. for the craft glue to dry, you could add some hot glue also. selection but they did get some red back in after Christmas. Leave about a 12" (at least) "tail" before your first gather of mesh. You will be tucking this in to the back of the wreath later. chenille stem at the far right top side of the wreath. onto the frame by twisting the arms tightly on top of the mesh. your first point of attachment. that it can cover that side of the wire frame. top at point 3 and also has some "slack" to make a pouf. leave too much mesh on the edge...it will hide the heart shape. Keep going top to bottom and back with the mesh. Don't skip any attachments points...you need them all. pumpkin or the Santa belly so the heart shape would be evident. visually fuller without affecting the shape of the heart. the other mesh and usually stay in place easily. back around to look at the front. wire form, but I wanted a little more defined heart shape. "sew" the mesh closer to the wire frame. makes the wreath a little quirky and whimsical. to try them. I don't know how to make a PDF . 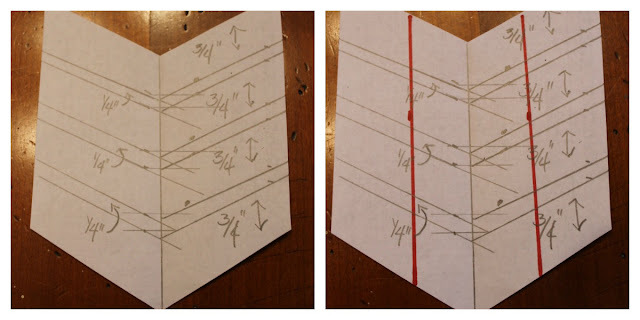 The shaft on the arrow for both pieces is 1 3/4" wide. out as a 5" tall and 4" wide piece of paper. The feathers are 3/4" wide with a 1/4" space between. cut into the width of the shaft. They were traced onto the black sheet of foam and cut out. glued on with foam glue. rod while the glue dried. 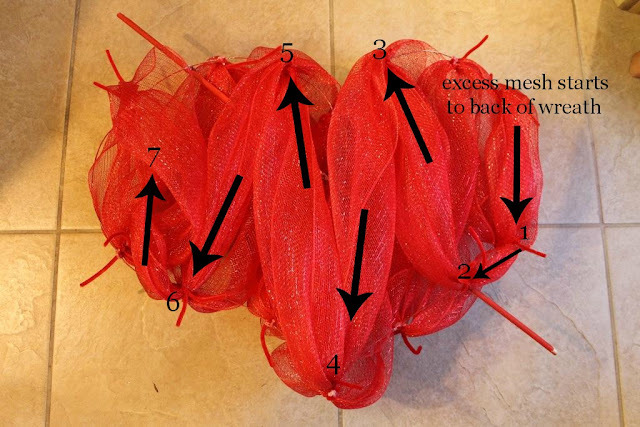 tied between the rounded tops of the heart to hang it. curly decorative ribbons at the attachment points. widest point. The total width with the arrow was 32". could possibly be for my house. door visually. I might change it to red or try glittering it. Whatever I do (if anything) needs to be weather resistant.. It shows up much better against the mortar-washed brick. but not perfectly...it still has personality. Hi Miss Kitty, I love this red mesh valentine and arrow. Your tutorial is easy to follow. Just Beautiful! I love this wreath. This is so cute. You did a great job. Your mesh wreaths always look so beautiful and this one is no exception. It is a good size for your door and maybe the arrow will show up better if it was white or covered in foil. I don't know if glitter would stand up to the elements either. You have such good ideas - I'm sure you'll come up with one that works. I love the wreath, so large and puffy! 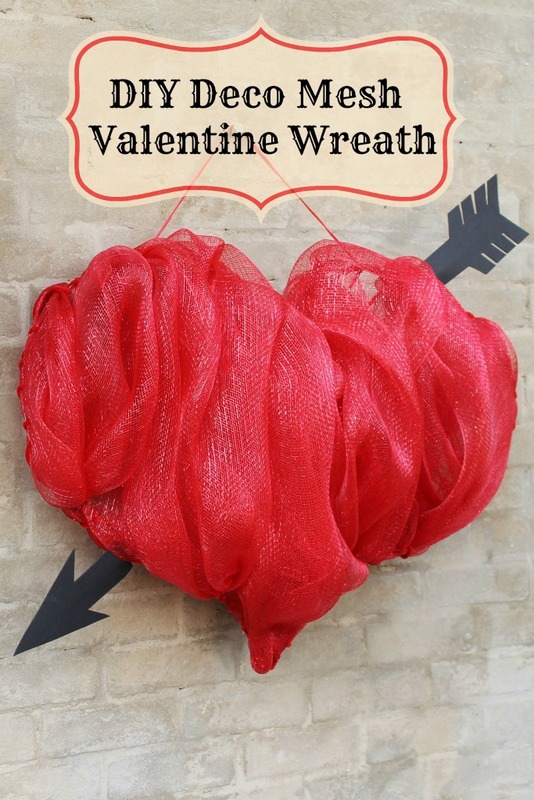 Your valentine's crafts are all so cute. Great job. Such a sweet wreath and you gave such wonderful instructions...I may even be able to do that you gave such good info! I think you are the mesh queen! I have never seen so many projects done so well with mesh. Cute! I don't think I realized the size till I saw it on the door! Thanks for linking up at Throwback Thursday. I love this wreath, thanks for sharing. I will be making it with my library teen group following your instructions.